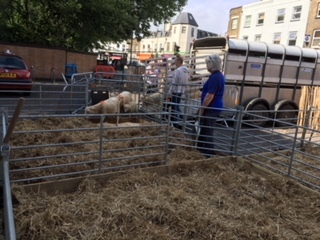 Six week old calves in Clapham Junction, cosily nestling into the straw, while the fire sirens blared past, and the buses stopped, and passers by gawped, and took photo after photo. It took two days to make the space ready, erect fencing, assembling pens and paraphernalia. And prepare all the necessary bits and pieces. At last they arrived late afternoon. First off came the sheep with four lambs, looking every which way, until they saw an open gate. Then they were through. They had done this herding and following bit before. Then came the pigs. More caution now for man and beast, because this was a new thing. 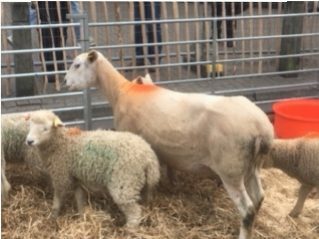 Slowly they inched forward, sniffing every piece of straw, until pressed into their pen, and they have been happy ever since. Next it was the calves turn. Stretching their stiff travelled legs, and looking out over the ramp. Yes, that is Providence House; but I don’t think they had heard of it. 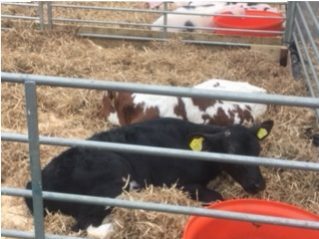 There is something dainty, hesitant, about calves as they step forward, their large searching eyes looking to the left and right. 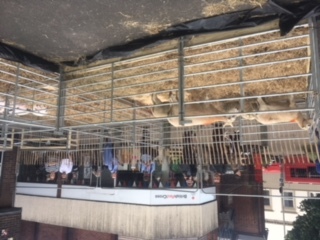 But down the ramp they came, and onto a bed of straw. Another look round, a gulp of water, and standing slim, and pretty, silky black, and brown and white. A good urban image. They even treated us to a skip or two. The last of the old testament prophets also saw calves skip. I expect he saw it over and again, watching as the yard gate was opened and the calves leaped into the pasture. He said that is the experience of faith, of those who place their faith in Christ as Saviour. It is like a calf leaping for joy. It is a release into a fresh world. It is a release into an old world made fresh. It is like greeting the sun in the morning, rising to begin a new day. – Robert Musgrave, Chairman Shallowford Trust.